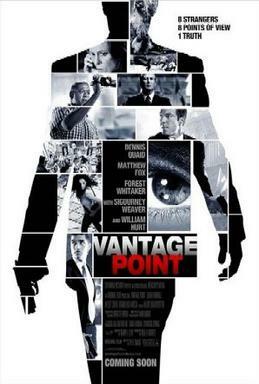 Vantage Point is a 2008 thriller film, written by Barry Levy and directed by Pete Travis. It stars Dennis Quaid, Matthew Fox, Forest Whitaker with Sigourney Weaver andWilliam Hurt. It was released on February 22, 2008. The film is rated PG-13 by the Motion Picture Association of America for sequences of intense violence and action, some disturbing images, and brief strong language. The film is set in Salamanca, Spain, but it was filmed in Mexico, even though some of the scenes were shot in that city. The United States President Henry Ashton (William Hurt) is holding an anti-terrorism summit in Salamanca. Over a twenty-three-minute period, an assassination attempt on the President unfolds. The film loops through this period over and over, each time from the perspective of a different participant, adding a new piece to the larger puzzle with each loop. The first perspective is that of television news producer Rex Brooks (Sigourney Weaver) who directs various “GNN” cameramen and news anchors as the “President” arrives. Actually, unknown to the public and GNN, and initially to the film audience, it is a body double of the president. Just as the mayor of Salamanca finishes his speech and the “President” steps up to the podium, he is shot twice. An explosion in the distance soon follows, and a few minutes later the podium is destroyed by another explosion. Their perspective ends as their news reporter lies dead in front of the camera. The second perspective is that of Secret Service agents Thomas Barnes (Dennis Quaid) and Kent Taylor (Matthew Fox). While the mayor is speaking, Barnes notices a moving curtain in a nearby building. Agents sent to investigate find a fan that they report had been left on. Barnes also spots a man with a video camera in the crowd. After the “president” is shot, he tackles a man rushing the podium, who is then dragged off by other agents. Barnes and Taylor run up to the man they saw earlier and Barnes insists on viewing the footage on the video camera. Barnes is fairly sure that he spotted the shooter in one of the windows and the man thinks he might have caught the assassin on film. Taylor announces his intentions to go after the assassin. Barnes wants to come with, but Taylor tells Barnes to stay in order to avoid being blamed for failing to spot the assassin in time. Taylor goes off in pursuit as Barnes continues to review the footage. He sees something that alerts him to a probable bomb under the podium and starts running but is too late to alert anyone. Once the podium is destroyed, Barnes catches sight of a GNN cameraman fleeing the destruction, and heads for their van to get a better idea of what happened. He barges into the mobile production room and orders Brooks to show him their footage. While they are rewinding the film, Barnes talks to Taylor, who reports being in hot pursuit of the suspect and in need of immediate assistance. Barnes attempts to reach Control, the Secret Service temporary command center’s call sign, but does not get a response. His perspective ends when he catches sight of something shocking on one of the live feeds. This is followed by the perspective of Enrique (Eduardo Noriega), a police officer assigned to protect the mayor. He spots his girlfriend being embraced by a stranger and overhears them speaking about a meeting under a nearby underpass. When he confronts her, she assures him in Spanish that she loves him and him alone. She then asks if he has brought her bag and Enrique nods and hands it over. When the “president” is shot, Enrique rushes onto the stage to protect the mayor and is tackled by Agent Barnes. As he is in Secret Service custody, Enrique watches his girlfriend toss the bag he gave her under the podium. Realizing that there must have been a bomb in the bag, he breaks custody and starts running to the underpass that he heard about earlier while Secret Service agents attempt to recapture him but fail to do so while chasing him through several buildings. His scene ends as he confronts someone at the underpass, asking if they are surprised to see him still alive. Like in the previous scenes, the viewer is not shown the “surprise element”. ~ by darkdestroyer on April 2, 2008.